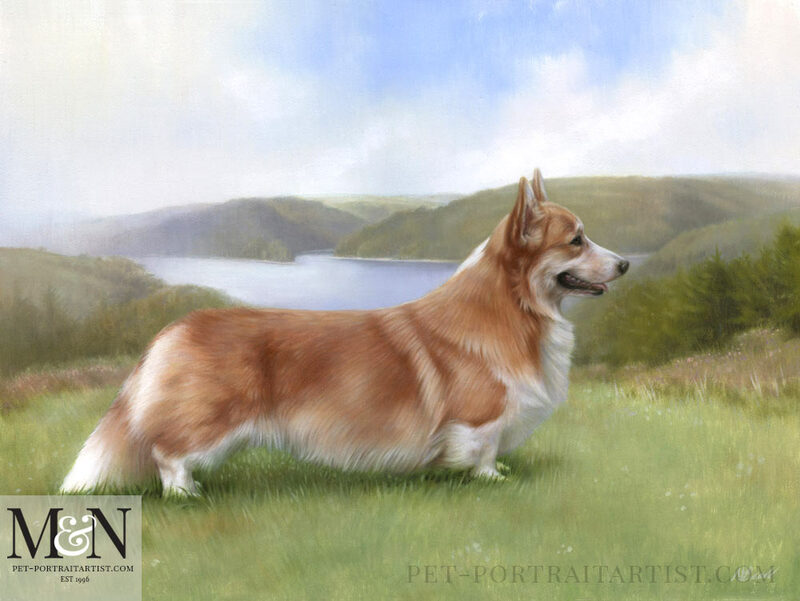 Welcome to our latest Corgi Oil Painting by Nicholas Beall. 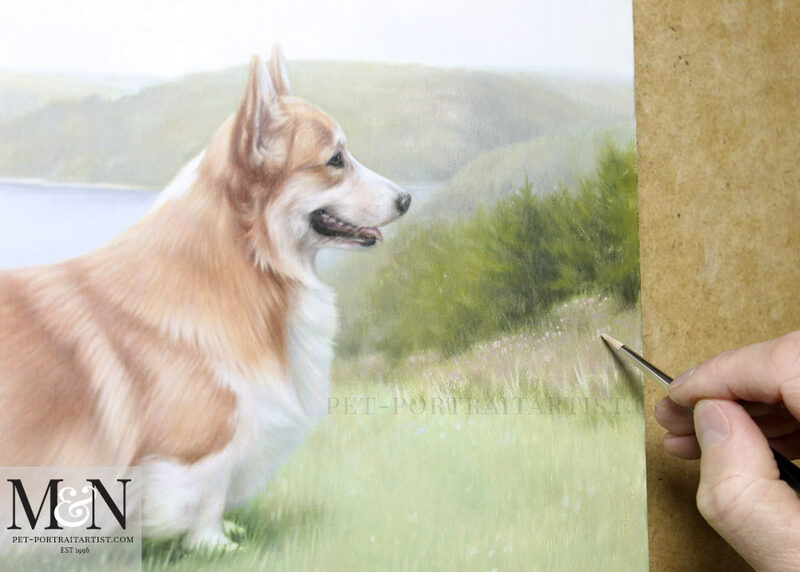 The portrait, a 16 x 12 oil painting traditionally hand painted by Nicholas, was commissioned by local client Suzanna of her Corgi Luke. We know Suzanna from our local dog club where we take Lily to once a week for obedience classes. Luke’s full name and title is Ch Nireno Luke Skywalker and he is a UK Champion. Last year Suzanna took a candid photo of Luke and it was the perfect photo of him. 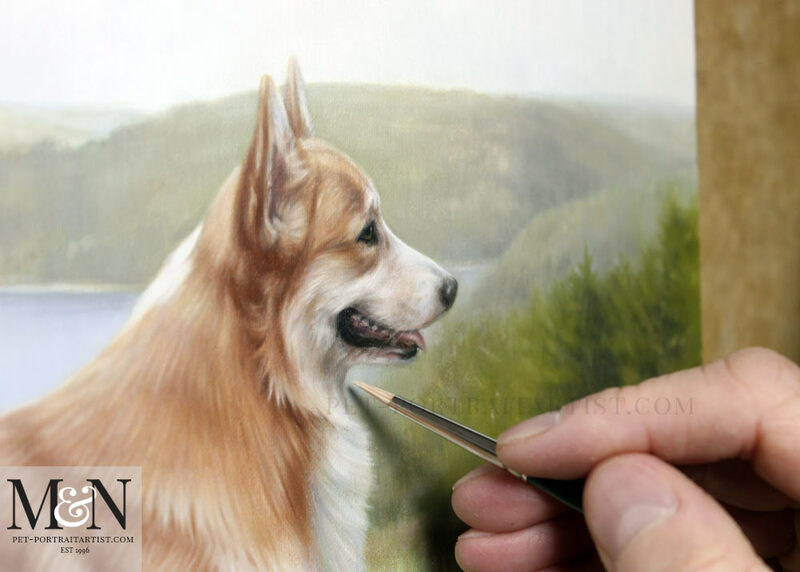 Suzanna asked Nicholas if he would be able to paint it, adding a different scene behind than the original photo. 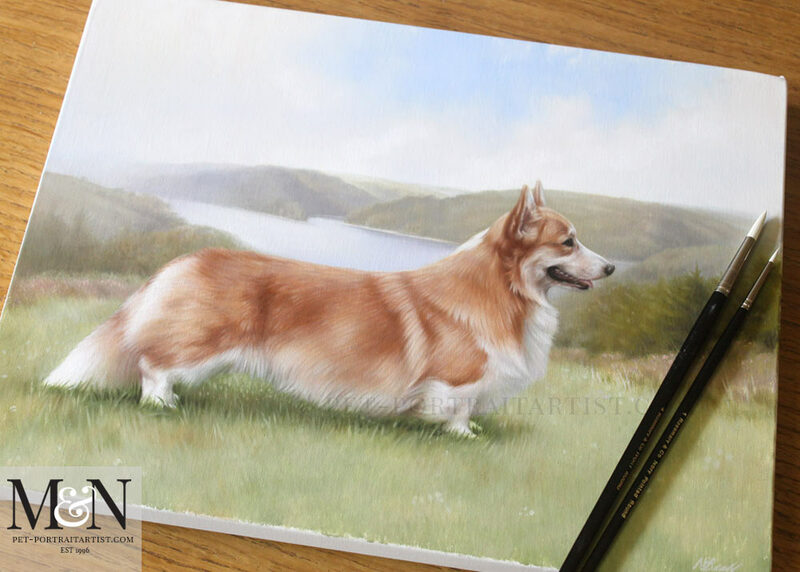 Luckily Suzanna had taken her dogs on a walk to the picturesque Llyn Briane here in Wales. 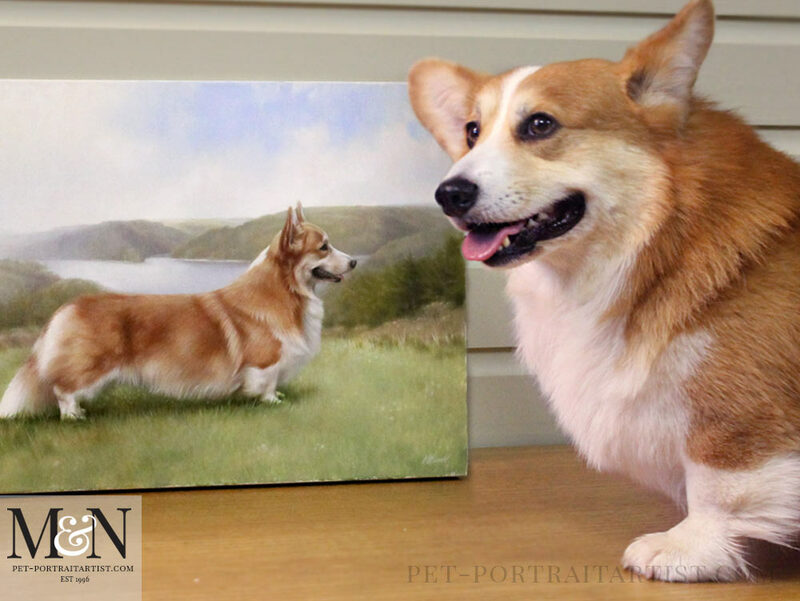 The photos were a perfect setting for Luke’s portrait. With a couple of these photos for reference, Nicholas painted Luke in this beautiful scene and it looks amazing as you can see below. Suzanna visited our studio to collect the painting of Luke and she was thrilled. It has received many wonderful comments on Suzanna’s Facebook page already. Scroll down to see photos of Luke with his painting, with photos of the portrait in progress along with candid photos of it on our plan chest. 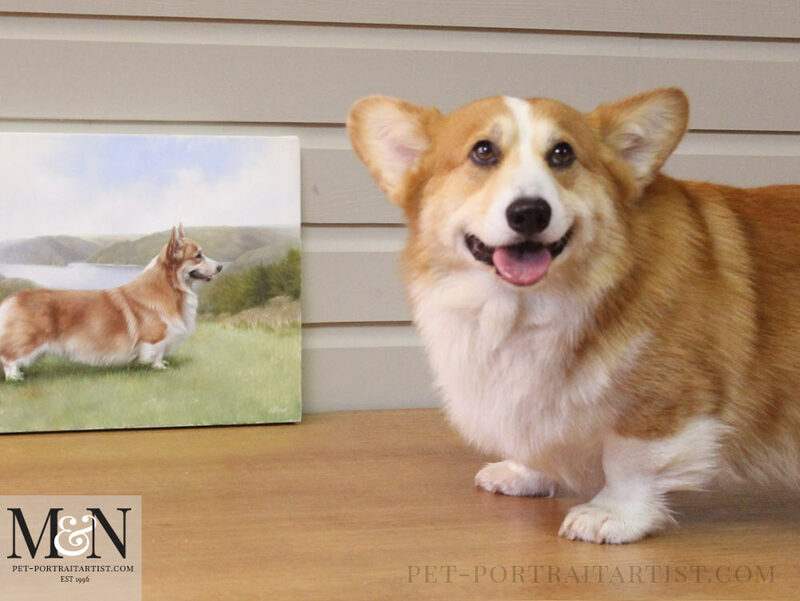 Here is Luke posing with his painting! We took a number of photos, some were very comical. We hope you enjoy viewing them. Here are a couple of photos of Luke’s painting on our plan chest with brushes to show scale. I’m going to try to use the same brushes or similar sized ones for these kinds of photos. Hopefully this will give some continuity to our story posts about our oil paintings. As you can see Nicholas uses Rosemary’s brushes. He has been using their brushes for around 18 years now, they are superb. Nicholas likes the long handled brushes, however you can get them shorter too. 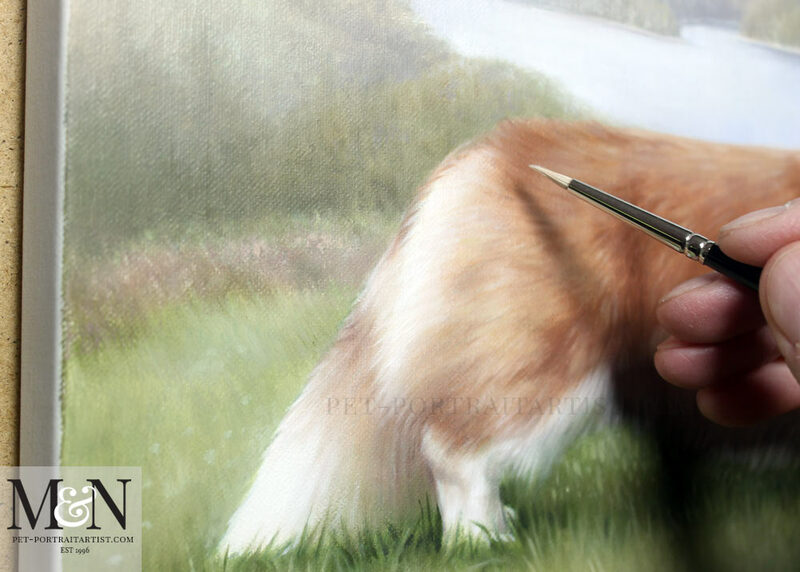 I took a few photos of Nicholas adding the final touches to the painting. I have tried to get up close to the canvas so you can see the painting in detail. Often our photos show our paintings far closer than a viewer would normally view them. Primarily we want our readers to see the paintings up close to show how fine the paint strokes are and how much detail goes into them. We hope you enjoy viewing the photos. 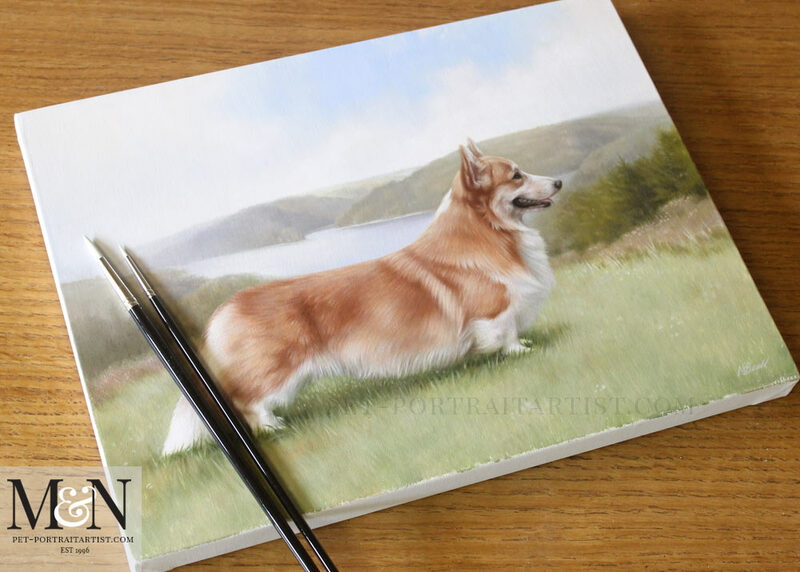 Every month I look forward to viewing your latest pet portrait paintings, each time I think they can not get any better, but each month I’m wowed by what you both do!